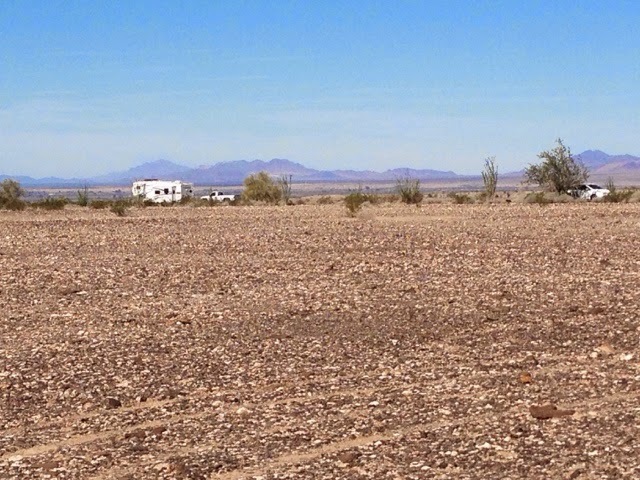 I've spent a day living on BLM land here in Ehrenberg, AZ with this one group of Vandwellers linked to Bob Wells that I wrote about yesterday. Suanne's Prius is the vehicle to the right. There are other Vandweller groups dispersed in the desert here and there, as well as groups of one or two. You can see from the picture above the distance that people generally keep between each other. 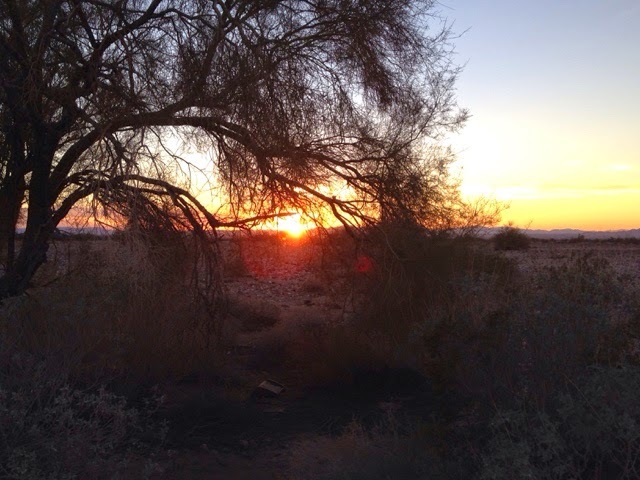 In contrast when Bob's group was over in Quartzsite, AZ BLM Land 20 miles east of here the pictures online show there were more people and they got together each day and had seminars and group cookouts. I went to Blythe, CA a few miles west from here, just across the Colorodo River to McDonalds WIFI for downloads and grade some of my student's work for the course I teach. It was windy all day with high wind warnings. 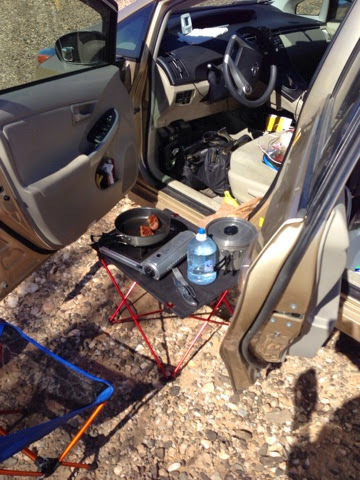 So when I got back to my desert parking spot I positioned the car to block the wind and opened both side doors to set up my cooking as the wind would now over my lightweight table and it would take forever to cook. 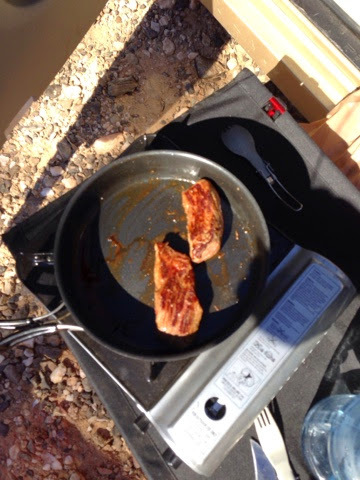 Beef is what is for dunch. These are the left over pices that I will save for another meal. The smallest package of beef on the shelf were these boneless short ribs. I also bought some chicken breast strips for tomorrow. I immediately remove the meat from its original packaging And repackage in baggies to better fit in the fridge. 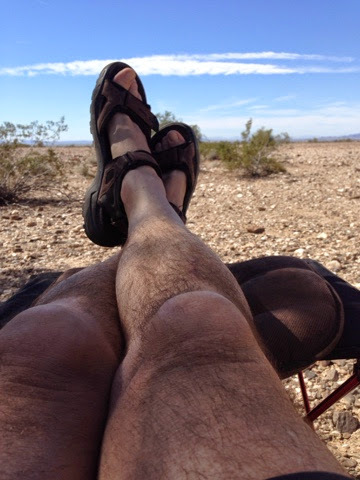 This afternoon out here in the desert all by myself I figured it was a good time for a selfie. 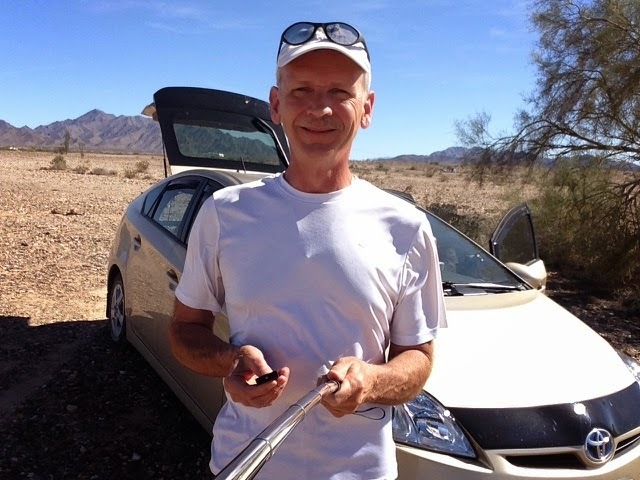 Thanks to my son Brent for the selfie stick. I can get a pucture with a background using the stick and an inferred clicker. My entertainment was to listen to the podcasts I downloaded this am, listen to the radio and read a book on my iPad. I am sitting in my light weight backpacking chair and have my legs up on my light weight table with one of the small cushions that I have on the platform for my rear seat. While I was reading I had 2 woman and 3 dogs come to visit. They were looking for Suanne. She had gone out for the afternoon. The two woman pollinated off to an area where they were that was about a 1/4 mile away. Tonight I watched TV while I blogged. Reflecting on my stay here it was like staying on BLM land in Quartzite last year. Very disbursed. Since I enjoy meeting and and talking to people on this trip, the disbursement of the people is not conducive to engaging with folks, although when I have aporoached other's sites I have felt welcomed to stop by. Regardless of this fact I wanted the opportunity to take my Prius to the desert and see how I do. Ehrenberg is not a destination so it is a good place to have as an overnight spot to stop on the way to and from unless you arrange a meet up with others to visit. Quartzite last year when j stopped was later but even though many have left the gathering there. There are still lots of people there and some flea markets are still up, but the shopping is poor there. Blythe at least has an Albertsons market as a decent grocery store. One more day here and it's on to Monterey, CA to visit son Clayton & family.